Nokia and Airtel are pioneering mobile payments in India but many kinks need to be straightened out. Sakkir Alam is a security guard at a hospital in Ernakulam, Kerala. Shihas Mohammed who owns a mobile phone shop near the hospital, where Alam recharges his prepaid phone, introduced Alam to mobile payments, a service offered by Nokia Money in collaboration with Union Bank and Yes Bank. Alam, 21, uses the service to send money to his parents in his village in North 24 Parganas district, West Bengal. This venture, launched in pilot mode in January 2010, now covers some 130 locations. It offers person-to-person money transfers, and payments to merchants and utility companies. Customers without a credit card or bank account can use it. But the last mile - the receiving end - is where it falters, especially in person-to-person transfers. So, while Alam can easily deposit money or recharge his mobile using his Nokia Money account, he finds it harder to withdraw cash, and so do his parents in the village. There are several reasons for this. Most agents are owners of small shops that sell mobile recharge coupons. If the shop is closed, Alam cannot get his money. Even if it is open, the agent is unlikely to have the money. Most agents find it risky to keep cash, and cannot anticipate whether their next customer will want Rs 500 or Rs 50,000. So Alam must wait while the agent trots off to the bank to bring his money. In the village, Alam's parents face a different set of hurdles. There is no agent in any village in the area, so they use the ATM card that Alam got when he opened his Nokia Money account. But the nearest Union Bank ATM is an hour's bus ride. Other banks' ATMs charge a Rs 20 fee. Agents say customers use the service to recharge mobiles, rather than transfer funds or pay bills. Gary Singh, Managing Director and General Manager of Nokia Money (Financial Services), is unperturbed. "Every service and customer goes through an evolution," he says. "People become comfortable with a service over time," he adds. The mobile payments market is growing. According to a May 2011 Boston Consulting Group report titled Digital India: The Rush to Mobile Money, the number of users of such services rose from 400 in August 2010 to 11 million in May 2011. The report estimates that person-to-person transactions for domestic and international remittances will add up to $70 billion in 2015-16. Airtel also has a mobile payment service, called Airtel Money, in the National Capital Region and Chennai. Another Bharti group company, Comviva, provides backend technology to Aircel and Vodafone for mobile payments, but these projects are in the pilot stage. Nokia Money not only covers more ground, but can also be used by anyone. Airtel Money is open only to Airtel customers. Signing up is easy. New customers must present identification as defined in the Reserve Bank of India's Know Your Customer, or KYC, guidelines. They can open prepaid accounts for deposits up to Rs 50,000. The service is activated quickly, and there is no minimum balance. Unlike Nokia's service, Airtel Money does not have personto-person transfers, because it gathers less KYC data than the RBI requires for this. Although Nokia's service covers more locations, it focuses exclusively on cities, making it harder for users-many of them migrant workers-to send money home. 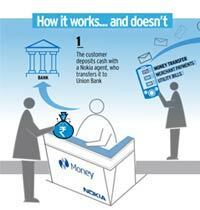 Nokia Money agents get a commission for every deposit received and charge customers Rs 25 for every withdrawal. For sums in hundreds, the fee may seem high, but Singh says customers accept it as a condition for the convenience. The ecosystem of mobile payment services is well developed in emerging economies, such as Bangladesh, Kenya, Philippines, and Senegal. Singh says services in India cannot be compared with the likes of, say, M-Pesa in Kenya, whose economy is dominated by a single telecom company (Safaricom) and single bank (Commercial Bank of Africa). When more companies offer mobile payment services here, he says, accessibility will improve. At present, the regulations of the National Payments Corporation of India, which monitors the mobile payments industry, do not allow money transfers across providers. For example, someone with an Airtel Money account cannot transfer cash to someone with a Nokia account. The industry expects this will change by late 2012, and that RBI will make it easier for customers to use any ATM by the year-end. But Nokia Money has problems. Agents say it has not paid up as promised. Mehtab Alam, an agent in Delhi's Daryaganj, says he may quit the dealership. "They promised me money for adding customers, plus 1% of deposits," he says, and adds that he has got no commission in four months. Asked about agents not receiving dues, Singh says it is "probably not true". Alam also says that most of his customers have ATM cards, so he makes no money from withdrawals. Mohammed, the agent in Ernakulam, says he offers mobile payments as "a social service" although the commission is low. "This shows Nokia is not listening," says Kunal Pande, Director at management consultancy KPMG in India and co-author of a research report titled Mobile Payments Outlook, published in July 2011. He says subsidising the service now may help it take off later. RBI sees mobile payments as a tool for financial inclusion. Banks stand to gain, too. They get deposits on which they pay out no interest. The Boston Consulting report says agents service customers for less than 50 paise per transaction, compared to Rs 40-60 at a bank branch. Union Bank's General Manager for Alternate Delivery Channels, Lalit Sinha, says: "We get customers who cannot be reached through traditional channels." KPMG's Pande says Nokia Money should keep agents happy so they continue to offer the service. The game will likely change substantially over the next two years, bringing in more players and greater access.